“Holly Mell, Taos High School student and winner of our D.H. Lawrence Critical Essay Contest, arrives at the DHL Ranch. 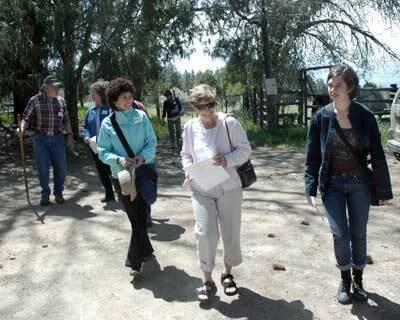 Walking with her are tour guests from Santa Fe. The Friends of DHL are sending Holly to present her essay, and some DHL lore from Taos, at the International DHL Conference in Eastwood, England, DHL's birthplace, this August. 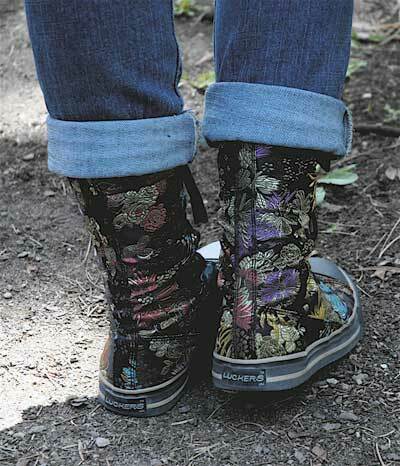 Holly Mell's boots at DHL Ranch. These boots are made for walkin' . 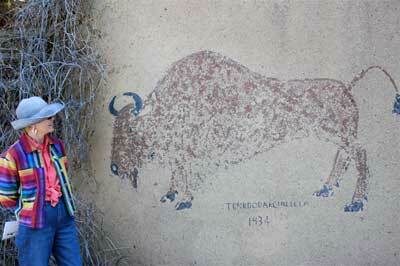 . .
Sharyn Udall, art historian and curator from Santa Fe, with the buffalo painted on the west wall of the Lawrence Cabin by Trinidad Archuleta of Taos Pueblo, nephew of Tony Luhan. Mark Luhan, Tony's grand-nephew, is researching ways to restore and preserve the painting. Two of the Friends with ties to the original Lawrence circle: Larry Vincent, left, son of famed Hispanic traditional musician Jenny Vincent, was named after Lawrence. He was born in neighboring San Cristobal because Frieda Lawrence met Jenny Vincent and her husband when they were touring DHL sites in England and Germany and invited them to visit her at the Ranch. 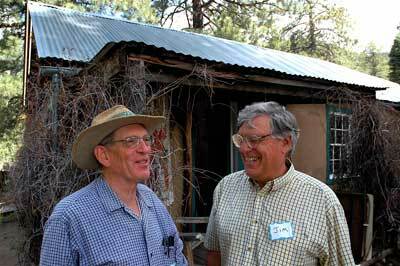 Jim Levy, right, is the chair of the Friends' Ranch Committee. 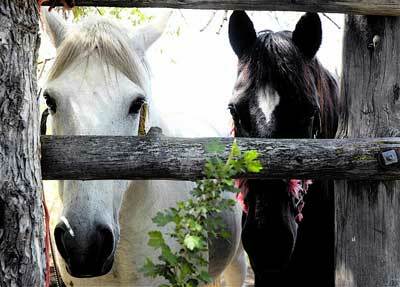 His parents rented from Mabel Dodge Luhan, who once wrote to Levy's mother, "If Jimmy rides his horse in my cornfield one more time ...."
These horse buddies live in the meadow at the Lawrence Ranch. 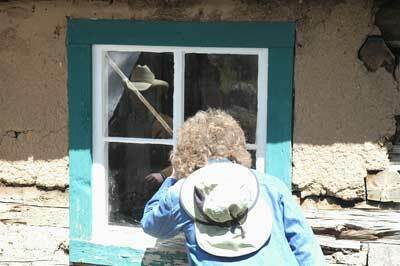 Tour guests peering into painter, Lady Dorothy Brett's, tiny cabin adjacent to the Lawrence Cabin. 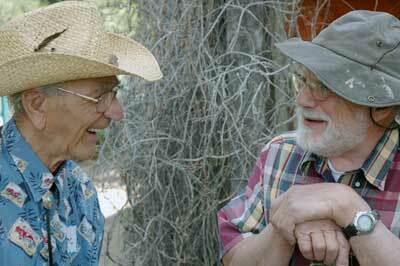 Brett typed Lawrence's manuscripts when he wrote at the Ranch, and stayed on after his death. She died in 1977 at 94. Friends Board member Jan Mellor's father, Eric, left, with Tom Decker of San Cristobal. 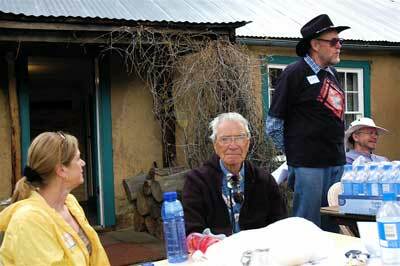 Decker ran the Taos Institute for the Arts, and is now on the Friends Ranch Committee. Hugh Hazen Witemeyer (black hat), Vice President and a founder of the Friends, read two of Lawrence's letters about his life at the Ranch at our lunch gathering. 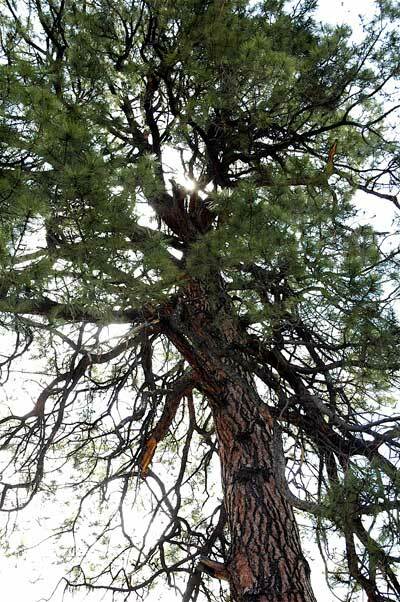 The towering Ponderosa pine beneath which Lawrence wrote still stands in front of the south-facing Lawrence Cabin. This is the tree Georgia O'Keeffe painted against a dark blue night sky with stars peeking through its boughs. 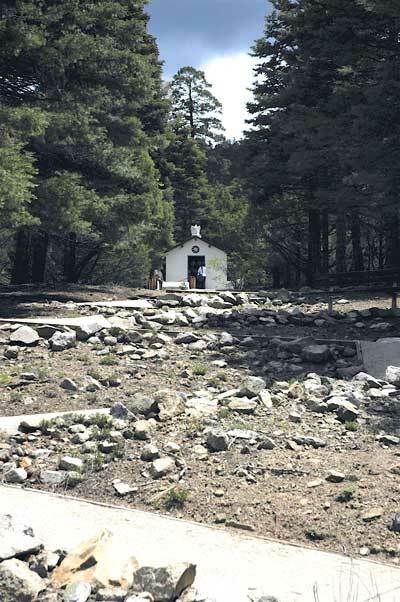 Just up the hill from the Cabin is the Lawrence memorial built by Frieda and her lover, Angelo Ravagli, in 1934. 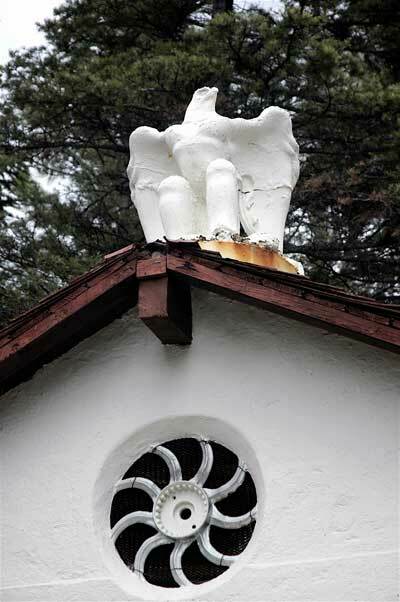 A spiral "rose window" made from a salvaged metal wheel and a sculpture of a phoenix, symbol of immortality, Lawrence's totem. 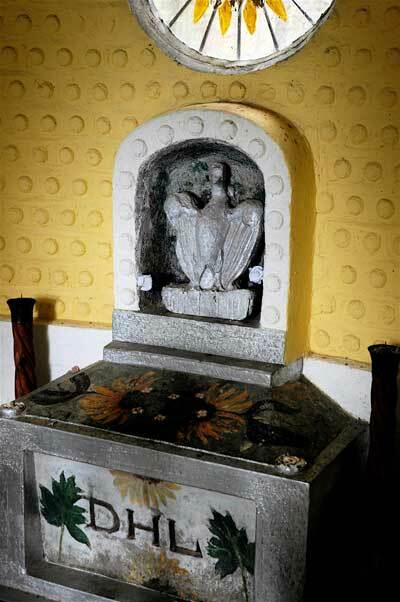 The altar inside the small Memorial with another phoenix. The window, above, was painted by Brett. Frieda said she mixed DHL's ashes into a wheelbarrow of cement being mixed for the altar where the sunflowers are painted.